Ulta Envy & Merry Christmas! Merry Christmas to everyone! I hope you're all enjoying good times with your family and friends, and that Santa delivered all of your wishes! I'm wearing my first Ulta polish, Envy. I used 2 coats and was very impressed with how nice the formula was. 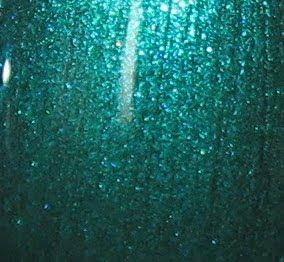 This is a deep Emerald green shimmer with an added bonus of aqua micro glitter mixed in. I'm going to go take a nap now. This holiday craziness has taken a toll on me, but it's been very enjoyable! This is a genuine emerald green and it is gorgeous. Happy Holidays to you too!